Fish broth has been on my to-do list for months. The medicinal and nutritional properties blow all the other broths out of the water. Not only does it help build strong bones like the others, it also contains iodine, thyroid-strengthening substances and fat-soluble vitamins. 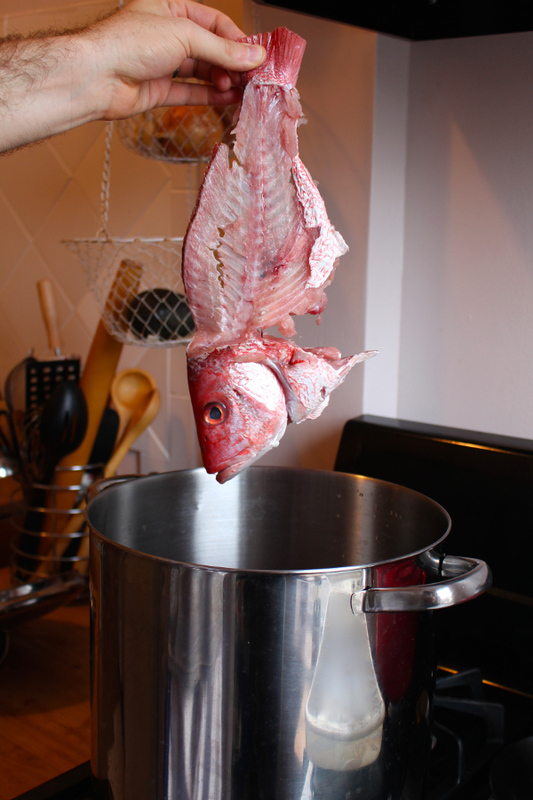 For fish broth you use the whole head and carcass of any non-oily fish. 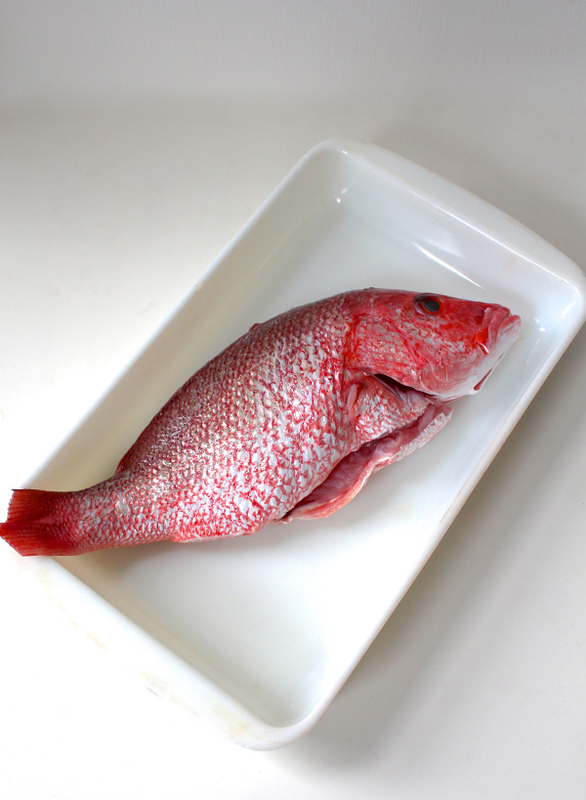 Most white fish are non-oily, like red snapper, sole, rock fish or halibut. The oil from fish like salmon or tuna are susceptible to rancidity. Omega 3 fat found at high levels in these fish are delicate and cannot be heated over a certain temperature. 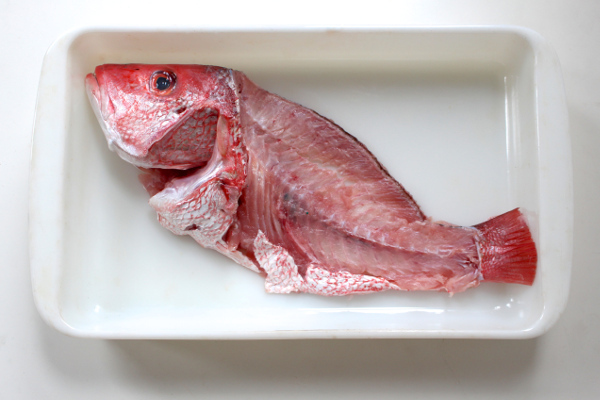 I stopped by my local fish monger and bought a whole red snapper. Yes, I have a fish monger in my neighborhood. If you need an alternative source, ask any seafood counter at a grocery store to save the fish head and carcass for you. They typically throw them away so they may even give them to you for free. I’m going to try this tactic next time. I wanted to practice my fish filleting skills so I paid for the whole fish this time. Cooking a fish head can be uncomfortable. Just think of it as similar to steaming a lobster. Keep the fish in the bag you bought it in until it’s ready to go in the pot. Then drop it in. Don’t look at it and you’ll be fine. I’ll be honest, it gets quite fishy in the kitchen. Make sure to keep the lid on the pot while the broth is cooking. And it’s a good idea to keep a window open when you’re straining the broth. Our house smelled like China Town on a hot summer day. Have some vinegar ready for clean-up. You’ll need it to deodorize your entire kitchen. Pour some in the pot with warm water and allow to sit for an hour, covered. And keep the window open! Fish broth is more nutritious and cooks in an eighth of the time of all other broths, two hours compared to 24 hours. The benefits are worth the stench. Add the stock to Ramen, use it to cook vegetables, soak rice in it, or make a simple soup with shrimp, mushrooms, scallions and broth. When you have stock on hand, you can whip up a quick, delicious soup in 15 minutes. Nourishing fish broth to add to soups and cook with vegetables. ►Fill a large stock pot a quarter the way full with water. 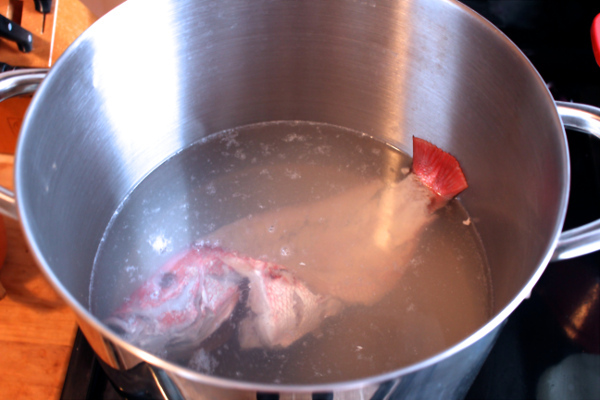 Bring water to simmer, add fish and apple cider vinegar then bring to boil. After boiling for three minutes remove any scum that has risen to the top of the water. I use a ladle for this. ►Reduce heat to low, cover and cook for 2 hours. ►Allow to cool for 30 minutes. Strain the broth and store in glass containers (link) in the fridge or freeze. Cheese cloth is an easy way to strain. 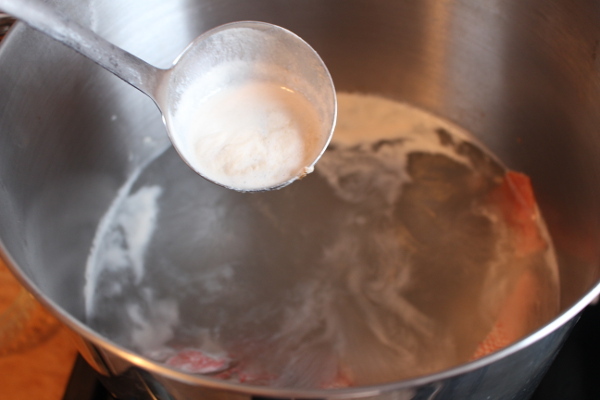 Fit a piece over a glass jar and hold in place as you pour the broth into the jar. Discard the cheesecloth. ►Freeze any broth you will not use in a week.